Scan of an old postcard. A scene from the very early part of the C&I's history. For a larger version of the above, click here. At about the same time, John Heisley Weaver of Philadelphia opened a coal mine at Possum Glory in Pine Township, Indiana County. By 1912, Possum Glory would become known as Heilwood (I wondered, could it be a corruption of "Heisleywood"? - nope, Heil was Weaver's nickname), taken from Mr. Weaver's middle name. (An old road sign once located south of Heilwood on PA 403 said that the town was named for John Heil Weaver.) 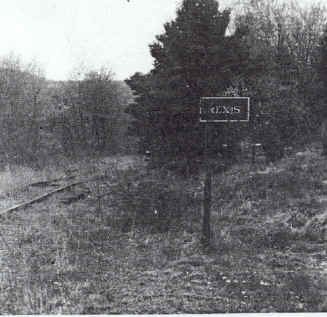 The coal was shipped over the Possum Glory Branch of the Cherry Tree and Dixonville Railroad (CT&D), a joint venture of the PRR and the New York Central (NYC). This peculiar partnership resulted when both railroads reached the town of Cherry Tree at the same time and both desired to build to coal fields lying west of there in Indiana County. There was no CT&D equipment, just trackage. The PRR and NYC operated over it through trackage rights agreements. For more on the interesting and unique story of the CT&D, click here for a brief overview of the CT&D. Another investor, B. Dawson Coleman, was also buying large tracts of mining rights in the area. A partnership was formed in 1909 between Coleman and Weaver, with Weaver holding 60% control of the partnership. 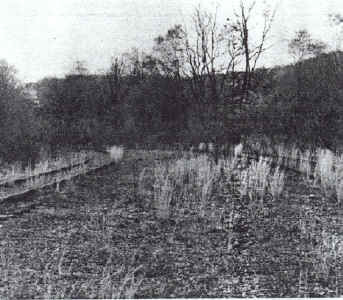 While planning their mining ventures in the area, Coleman and Weaver realized that owning a railroad to serve their mines as well as others in the immediate area would be quite advantageous, so the decision was made to purchase the Blacklick and Yellow Creek Railroad when the Vinton Lumber Company offered it for sale for the price of $100,000. 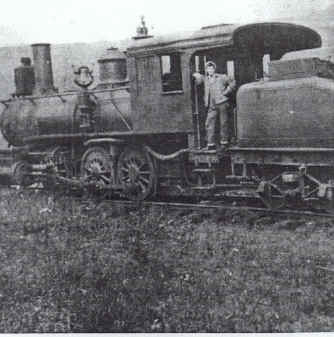 1907 picture of Charlie Gill on a Blacklick and Yellow Creek Railroad locomotive. Leona Clark Dusza photo. At the time of purchase, the B&YC extended north from Rexis for about ten miles to a location known as Stiles, just west of the Indiana-Cambria county border in Pine township. The decision was made to rebuild the line from White Mill to Stiles (It was "crooked as a ram's horn", according to one early official) and to extend it north past Pine Flats to meet the Possum Glory Branch of the CT&D at a location to be named Manver (the last syllables of the names Coleman and Weaver), along with a branch to the east to a mine site to be known as Colver (also from Coleman and Weaver). 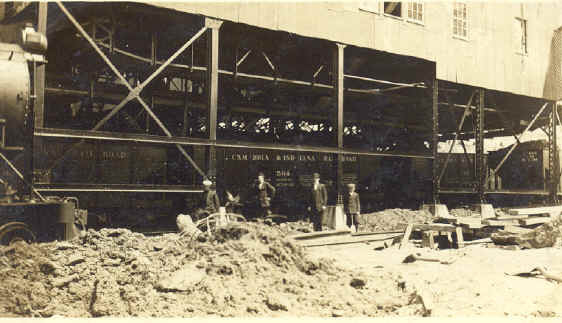 Construction began at both ends of the project in February, 1911. 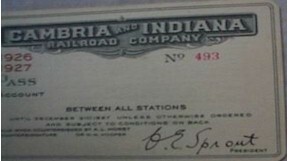 On April 20, 1911, the name of the Blacklick and Yellow Creek Railroad was officially changed to the Cambria and Indiana Railroad. In October 1911, the first shipment of coal over the C&I left Colver. (Originally, the town established adjacent to the mine site was called Colver Heights and some early C&I timetables refer to it as Mount Colver. Eventually it became known simply as Colver.) Not all of the coal originating on the C&I was to come from Coleman and Weaver mines - by 1919, 23 mines of various ownership were located along the C&I with others still to come. S. H. Jencks was chief engineer of the C&I in its early days. He kept a diary which recorded his work on the C&I, as well as other events in his life and in local industrial history. It makes for interesting reading. For a transcription of this work, click the following link: http://www.rootsweb.com/~pacblack/interests/Jencks/SHJ_Intro.html. 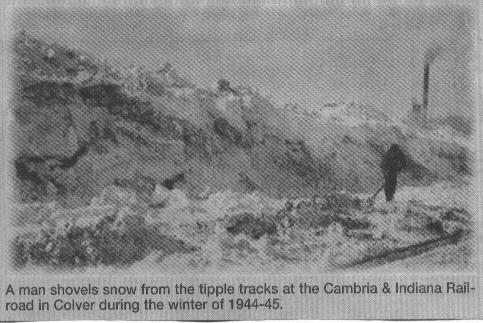 In 1963, the Cambria Branch was extended 4.7 miles eastward from Revloc to Mine 33 (Cambria Slope), east of Ebensburg, 2.1 miles of which were trackage rights over the PRR's Blacklick Secondary through Ebensburg. Other extensions of the C&I had been planned over the years but were never built, contributing factors usually being either PRR objections or terrain considerations. These included extensions to Johnstown, where Cambria Steel was one of Coleman and Weaver's biggest customers, to Bradley Junction and to a location off Howell's Run (which was to be called the Melva Extension), south of Ebensburg. An extension westward along Yellow Creek in Indiana County to a connection with the Buffalo, Rochester and Pittsburgh (which was to become part of the Baltimore and Ohio in 1932) near Lucernemines and Homer City was also considered several times but was ultimately never built. In 1922, the partnership of Coleman and Weaver was dissolved, due to a personal falling-out between the two men. Coleman took sole possession of the mine at Colver and sold his 40% of the C&I to a direct subsidiary of the New York Central, the Clearfield Bituminous Coal Company. (Many of the buildings along the line were painted in a gray and light green scheme, showing the NYC influence. photo) Coleman died in 1933 and his family sold the Colver mine to Eastern Gas & Fuel Associates, which later became Eastern Associated Coal Corporation. Weaver retained his 60% ownership of the C&I and took over the mines at Nanty Glo and Revloc. He died in 1934, but his company retained the rights to these properties until they were sold to Bethlehem Steel in May 1950. When Bethlehem became majority owner of the C&I, it saw that the motive power was soon converted from steam to diesel (EMD SW-9's). Bethlehem would later purchase the remaining 40% of the C&I in 1975. Although coal was the main money-maker for the C&I, there was other freight to be handled. Some examples: a quarry served by the C&I operated at one time near Red Mill (Nipton). The remains of one of the quarry's buildings can been seen along the Rexis Branch, just south of the bridge over the North Branch of the Blacklick Creek (click here for a picture). Boxcar loads of Christmas trees originated on the line (Indiana County still bills itself as the Christmas Tree Capitol of the World). C&I 15, an SW-1500, emerges from beneath the US 219 overpass at a location called Steel, near Revloc. By 1962, there were only four mines left on the line - the three original Coleman & Weaver mines and a small mine at Cardiff. Within the next three years though, the C&I's business would pick up - Bethlehem opened Mine 33 near Ebensburg in 1963 and Barnes & Tucker opened a large mine at Stiles in 1965. The C&I would eventually add four new SW-1500's and later two new MP-15's to their roster of SW9's and SW1200's as a result of the new business. By then, most freight left the C&I at either Nanty Glo or Ebensburg. 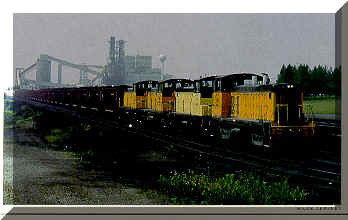 Coal bound for Bethlehem Steel's Buffalo and Bethlehem plants left the line at Manver and a unit coal train from Stiles bound for Pennsylvania Power and Light (PP&L) left the C&I via the Rexis Branch. The beginnings of the end... and could there be a new beginning? Unfortunately, the mining industry in Cambria and Indiana counties has declined steadily over the last 25 years to the point that almost all area mines are gone. This led to the shortening and eventually the apparent demise of the C&I. Natural and economic disasters impacted the C&I beginning in the late 70's. In 1977, a massive flood struck the area, destroying much of the Rexis Branch. It was subsequently abandoned. The Rexis Branch connected to Conrail's Blacklick Secondary, which was also severely damaged and abandoned between Dias (north of Armagh) in Indiana County and Beulah (east of Nanty Glo) in Cambria County. This right-of-way became the Ghost Town Trail, which has become a quite popular destination for bicyclists and walkers. May 13, 1984 photos of C&I at Rexis before ties and rails were removed by the Kovalchick Salvage Company the same year. No trains have been here since the great flood of July 19,1977. Today, the Rexis Access Area of the Ghost Town Trail exists on this property - see the "A hopper comes home to Rexis" page of this site for present-day photos of this area. Economic hardship for Penn Central/Conrail and Bethlehem Steel also eventually took its toll on the C&I. The cutbacks and eventual shutdown of Bethlehem's Lackawanna plant at Buffalo and Penn Central's post-merger track redundancies would make the connection at Manver unnecessary. Conrail removed the Manver secondary (formerly the CT&D Possum Glory branch, the mine at Heilwood closed long ago) and the C&I took up its tracks from Manver to Glory Crossing, near Mentcle. In the late 70's to mid 80's the mines at Colver, Nanty Glo and Stiles all ceased operation, leaving Mine 33 (Cambria Slope) at Ebensburg as the C&I's last remaining regular customer. The section of its main line from Glory Crossing south to Adele Crossing near White Mill was sold to InterPower of PA, the company that has built the co-generation plant near Colver. 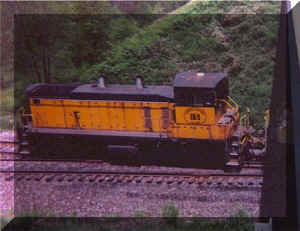 In the early 90's, a locomotive service facility with offices was constructed on the former Revloc mine property, eliminating the 20 mile return trip to the engine houses at Colver after a day of service at Mine 33 and resulting in greatly lessened use of trackage north of Revloc and the facilities at Colver. This photo, taken by Mark Leppert, appeared in Trains Magazine in November 1994. It shows the last (and largest) shipment of coal from Cambria Slope mine 33 and the last C&I freight train - marking the end of an era. In the summer of 1994, Bethlehem (subsidiary BethEnergy) closed down Mine 33. The C&I became a fallen flag. A year later, all of the C&I's remaining trackage was removed for scrap except for the section branching off of Conrail leading back to Mine 33 east of Ebensburg (the section from Beth to Cambria Slope). The section bought by InterPower was also torn up. C&I donated much of the abandoned right-of-way to the Cambria County Conservation and Recreation Authority, the organization that administers the Ghost Town Trail in that county (the right-of-way of the Rexis Branch had already been donated in 1993). In 2017, a trail extension was opened between the north end of the Rexis Branch of the trail at White Mill along the old C&I right of way heading east, then south through Belsano to Expedite, north of Nanty Glo. there are 2 old C&I hoppers in service, sort of. Ontario Midland RR in New York state bought 2-2-pocket hoppers back in the '80's for ballast service. If memory is correct they were 165 and 404 (or 414?) but I'm not positive. OMID renumbered them 201 and 202 but I'm not sure in which order. Conrail sold what was left of the eastern end of the Blacklick Secondary, which runs through Ebensburg, to RJ Corman, along with the rest of CR's "Clearfield Cluster" in the mid to late 90's. The Clearfield Cluster included CR trackage in Clearfield, Cambria, Centre and Indiana counties lying north of the Pittsburgh to Harrisburg main line and south of the Buffalo to Harrisburg line. RJ Corman had announced plans to scrap the Blacklick Secondary west of Ebensburg Junction (where it meets the Cresson Secondary), but then this report from Railpace Newsmagazine appeared in February 1998: Bethlehem Steel's Cambria and Indiana Railroad will purchase the abandoned 9.6 mile portion of the Blacklick Secondary Between Ebensburg Junction (milepost 6.4) and Nanty Glo (milepost 16) from RJ Corman for a price set by the Surface Transportation Board at $314,774. The purchase of track did happen, so the remaining C&I track did not become orphaned. Dismantling of the large structures at Mine 33 which were visible from US Route 22 took place in late 1999... why did rail access to that site need to be preserved? That question would be answered a few years later. Bethlehem Steel was sold to International Steel Group of Cleveland in 2003. The Johnstown Tribune-Democrat reported on both April 13 and April 23, 2003 that lands owned by Bethlehem which ISG is interested in includes Mine 33. The C&I continued to be listed on Bethlehem's and later ISG's Subsidiary Railroad web site, so it still existed, if only as a few unused miles of track. On December 31, 2003, the Surface Transportation Board announced its approval of the sale of the PB&NE, C&BL, and the C&I from ISG to Lehigh Valley Rail Management, LLC. Read the report Then on April 6, 2004, nearly ten years after the closing of mine 33 and the end of C&I operations, big news came - The Tribune-Democrat reported that ISG would reopen Mine 33, a new portal would be sunk near Sankertown, and a coke production plant would be built on the present site. On August 21, 2004, the Altoona Mirror reported that plans to reopen Mine 33 were moving at a faster rate, with preparation to return to the facility to use beginning in January 2006 if all goes well, years earlier than originally estimated. Most of the coal will be used to produce coke for steel making, with the rest used to generate electricity. A letter was later sent to the papers by a company executive, clarifying that the portal near Sankertown/Cresson would be a new mine, coal from it and other mines would be trucked to a cleaning facility near Portage then shipped by rail to the former Mine 33 site, where a coke oven facility would be built. As of 10/05, the coking facility was still in the works, but an environmental group had expressed concerns about emissions and had taken legal action. Article in the March 1971 issue of Trains entitled: This Is A Short Line? by David H. Hamley. 8 pages long. Excellent article! by Dale L. Suiters. 64 pages. Lots of great historic pictures. I also recommend a trip to two locations: the Altoona, PA public library, easily accessible from 17th street and just a few blocks from the Altoona Railroaders Memorial Museum, if you're interested in the history of area railroading - there are quite a few interesting reference books in a small room on the top floor; and the Cambria County Historical Society, located on North Center Street in Ebensburg, has a couple of folders full of information on the C&I.